Samsung revealed a vast new range of products at the IFA expo in Berlin this morning. Dr Jong Woo Park of Samsung unveiled the company's amazing new array of digital products at its glitzy press conference in Berlin. "What good is technology if it doesn't make our life easier and more enjoyable?" he said as he began his presentation. Samsung's new range of home entertainment products includes a 70-inch LED LCD TV and its first ever Duo HD disc player, the BD-UP5000, which supports both Blu-ray and HD DVD. Until now, Samsung had been supporting only the Blu-ray disc format, a strategy which now appears to be changing. Another first for Samsung is its new HT-BD2 BD Home Theatre system which offers Blu-ray playback alongside a 1,100 watt hi-fi system. Dr Jong Woo Park was also very keen to show off Samsung's amazing new range of MP3 players. The new generation is led by the YP-P2 player which has Bluetooth connectivity, and can even be connected to a Samsung mobile phone to answer calls. The general message from Samsung this morning was that it is trying to significantly improve "user experience" in all sorts of different "user environments". A new, uniform user interface is being introduced across all its products, for what it called a "seamless experience". 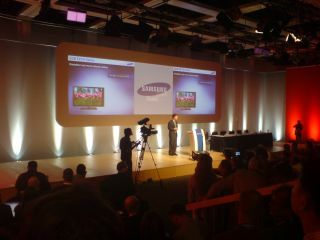 In the future, Dr Jong Woo Park said, all Samsung products will be able to connect and interact with each other. So your phone and MP3 player and Blu-ray player will all be able to talk to each other via Bluetooth. Samsung also took the lid off its new premium 'SmartLighting' technology for use in its top of the range LCD TVs. Using LED backlighting, the new F9 series of LCD TVs can reach a stunning contrast ratio of 600000:1.